You need to explain what you want to use it for. I want to use it for bands. Venues where are about 100-150 people sometimes more. I don't know anything about PA systems but hopefully someone else will be able to tell you what sort of situations these are suitable for. Those specs just mean that the speaker can handle different high loads for different durations before either overheating, shutting down or damage, I don't know which. This document explains more about the terms. I think you might want to buy two JBL MRX525s. It helps people if you get the product reference right. Those speakers have a rating of 800 W / 1600 W / 3200 W at 4 ohms - that's 800W RMS, 1600W program and 3200W peak. You'd normally want an amplifier that has 1.5x to 2x the RMS power of the speakers, so you'd try to match the RMS value of the amplifier (as rated into 4 ohms) per channel to the program rating of the speakers. So for those speakers you'd be looking for an amp that provided between 1200W and 1600W RMS per channel into 4 ohms. RMS ratings are for continuous sine-wave tones at a constant amplitude. This is the amount of power that the speakers can dissipate without suffering permanent damage but this is normally for an hour if no time is given. The heat in the voice coil will continue to build up over time, so for longer periods of continuous full output, the speaker needs to be de-rated, so 800W might become 700W maximum for very long periods. Music isn't constant in output and is normally very dynamic, with the average energy level being much less than the peak levels. Which is why, in order to get the most out of the speakers, you use an amplifier with more power than the speaker's RMS value. With a less powerful amplifier, you will be tempted to turn it up to get enough volume, which then leads to the danger of overdriving the amp into clipping, which produces a lot of high-frequency energy that the HF driver can't take for long, and it then burns out. With those speakers being 4 ohms each, you will be best having two amplifiers. Whilst some amplifiers will run into 2 ohms (the resultant impedance when you connect them in parallel), this is often only in bridged mode (where both sides of the amplifier are configured to work together as one output), so you'd still end up needing two 2-channel amplifiers. And really low load impedances are best avoided if possible. But unless you need two speakers per side for coverage of an awkwardly shaped space, you really are better off sticking with one set of main speakers each side. There are quite a few posts here about running two sets of speakers per side, and it is always discouraged because of the comb-filtering you get with two speakers producing the same sound placed side-by-side. Also, the way the decibels add up, you don't get much of an increase in sound levels. For more volume, add one or two subs per side, which lets the main speakers produce more volume in the highs and mids whilst the subs cover the bass. Just a couple of examples, but they are there. And they will all be relatively expensive compared to the speakers. But I'd go the powered/active speaker route and avoid the trouble of matching an amp to the speaker. I don't know anything about those JBL MRX525 speakers, but personally I'd avoid speakers with two 15" drivers in as they generally aren't well regarded for voice reproduction. I'd suggest looking for main speakers with 10" or 12" drivers and add a sub for the bass. I once had a pair of passive JBL EON15 speakers and whilst they were loud, there was quite a harsh midrange to them around the crossover point. The amp is important but my rule of thumb is to go for a slightly overpowered amp. there are probably exceptions but I was generously given a stupidly powerful amp to power my KRK 6000s (an older model long before KRK Rokits which I do not like). Having more power means the amp will not be anywhere close to distortion. it gives a very clean output. Of course you have to be careful not to blow your speakers, just set the amps master volume to a sensible level. A low powered amp with cause speakers to distort more which can in turn burn out the drivers. All in ones are a neat solution. Their are mixed feelings about the use of amps inbuilt but I don't think a well designed speaker should be of concern with this approach. You can spend more then on decent monitors. For speaker loudness, you need to forget about 'power' (though it does play a part) and look at the maximum SPL produced. 131-132dB is a pretty loud speaker and will be suitable for most venues for 150-200 people. Those LD Stinger 28A G3 speakers look good on paper, though you'd really need to hear them perform in comparison to other speakers. Many speakers look good on paper but shortcomings can appear when used with dynamic music. You'd probably only need one sub per side to get a balanced sound. Two are really only needed if you really want to put out a lot of bass for dance music or move to a much larger venue. Don't underestimate the weight and size of subs if you've got to store and transport them. thnx!! i have one more quest. How to hang up and 2x15" speaker on a truss? is it possibe because to place it on a sub its too low. Thnx for help! The MXR525 does not have fly points fitted so flying them is not possible I'm afraid. As Sam says, it's designed for floor mounting. If you have a proper stage, of say 5'-6' (150-180cm) high then placing them on the stage should be sufficient. With a lower stage, then they could be placed on sturdy tables or crates. If there's no stage as such, then you really ought to be looking at different speakers, with just one main driver. that are compact enough to be mounted on speaker stands. We've probably said it before but the Yamaha DXR range of active speakers are very good as a starting point for comparing speakers. The DXR12 will push out 132dB, so are as loud as the JBL MRX525 with a 1600Wpc power amp. They aren't that heavy and can easily be mounted on speaker stands. They can also be flown if necessary with the right accessories. The DXR10s are only 1dB down and are even more compact. You also get a very long warranty period with them (7 years if bought in the European Economic Area though it may also apply elsewhere). For a lower budget, the Alto TS312 is about half the price of a Yamaha DXR12 and produces a similar sound level. It too can be stand mounted or flown. Maybe not quite as nice as the Yamaha, but very close. It's a fairly new model, so no info on how reliable it is. Just for a comparison much higher budget, the brand new Yamaha DZR12 produces twice the volume of the DXR12 (137db) in a similar format speaker, but each one costs twice the price of a DXR12. The biggest speaker in the DZR range is the DZR315, which is a 3-way speaker , (horn, 8" and 15") which produces an impressive 143dB maximum (so about four times as loud as a DXR12), but is also three times the cost of the DXR12 (but in terms of output and full-range ability is excellent value for money). But it's quite tall, and heavy at 42kg, so is either floor standing or can be flown, but not pole mounted. Reasonably compact active speakers can also be re-purposed as stage monitors if you upgrade the FOH (front of house) speakers in the future, which would not be possible with something like the JBL MXR525. A single Yamaha DXR12 can produce 131dBSPL, a single Fame LA unit produces 112dBSPL so you would need 6 of them to match the level of the Yamaha, the dB tech one is better at 126dBSPL per unit but still not as loud as the Yamaha. Both are significantly more expensive ways to achieve a similar output. The DXR can be flown, pole mounted or sat on top of a sub and cost €629 compared to €1299 for a 'set' of two dB DVA mini M2M/M2S and €290 each for the Fame LA4A (and you'd need 6 costing €1740 to achieve 130dBSPL). You've picked two very different units there. And you aren't looking at the dB levels they can produce. The Fame has a low maximum output of 112dB, and is more suited to vocal announcements and background music in say a bar or restaurant. To get 130dB, you'd theoretically need 64 units (though maybe a bit less as there will probably be some gain in overall efficiency as the speakers interact)! Line arrays do provide a more focussed sound in vertical dispersion compared to standard speakers, so can be a little quieter as a result as the sound is more concentrated with less hitting floors and ceilings, but you need quite a few units stacked vertically to get a good line array effect with a tight vertical distribution of sound. 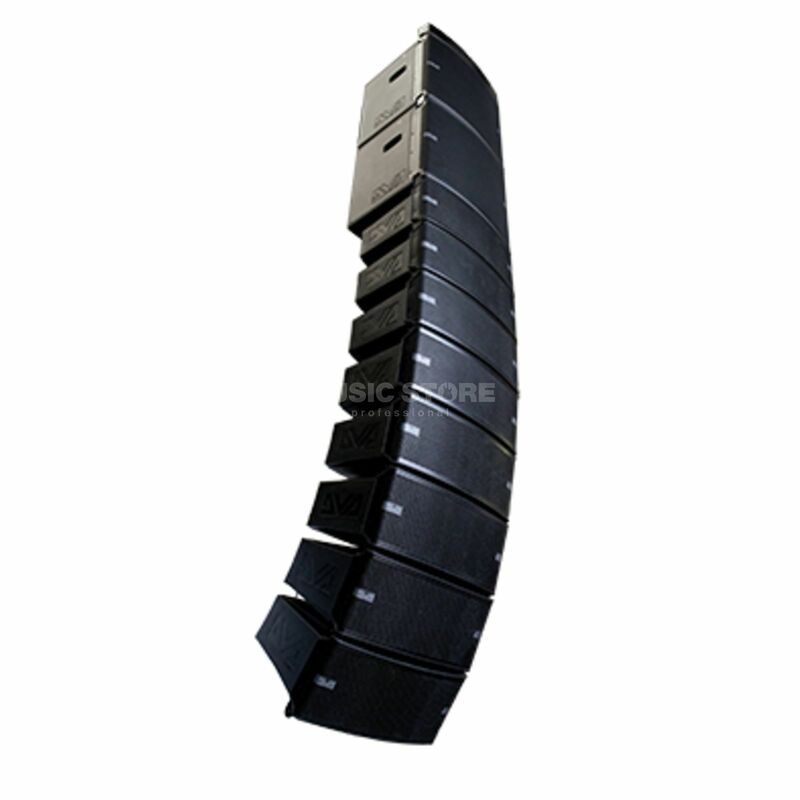 The image shown on the Music Store page for the dB speakers shows a good example of what a decent line array would look like (though they've shown subs stacked on top of the array, whereas they'd normally be located on or near the floor. To get the best out of a line array system, you would normally use provided software, where you put in the dimensions of the concert space, and the software would tell you to where and at which angle each speaker should be pointing for maximum controlled coverage of the space.